There are several major changes to System Preferences in OS X 10.8, Mountain Lion. Few preferences are unchanged, while some reveal subtle differences suggesting that the operating system has been revised throughout. 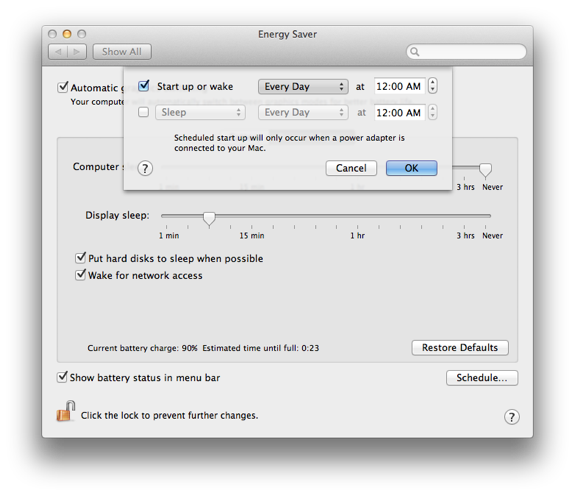 The Energy Saver preferences have had a number of changes particularly to options available, although the panel will seem familiar to those who have used earlier versions of OS X. A different Energy Saver preferences panel will be displayed depending on the type of computer being used. A desktop computer like the iMac or Mac mini will have a single pane while a notebook computer which can be run either from a battery or a power adapter, will have a preference pane for each of these. At the top of the pane for adjusting settings when a battery is being used there are two new radio buttons on my MacBook Pro which has two graphics cards. 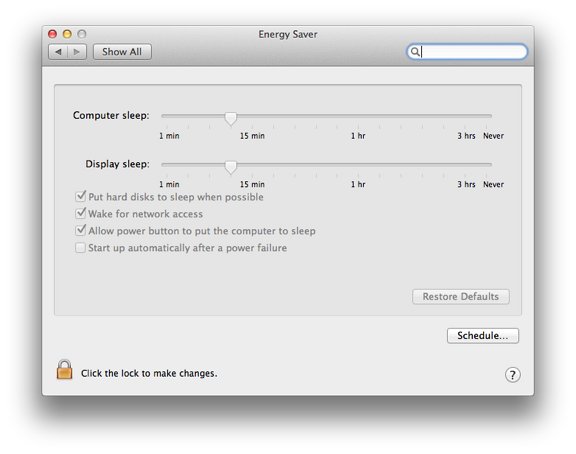 Instead of "Automatic Graphics Switching" that was available using a checkbox in OS X, 10.7, Lion, the new panel has two radio buttons: Better battery life; and Higher performance. The same radio options are available in the Power Adapter pane. The display information and features differ with the selected power source or with the computer. All, however have the common feature of two sliders for Computer sleep and display sleep: from 1 min to 3 hrs and Never. A number of checkboxes are available for controlling how the computer works with the sleep feature, although not all are available on every device. The wording for some of the selections has also been changed with the upgrade to OS X 10.8. The last one is not available on the MacBook Pro I use. With the previous version of OS X on the MacBook Pro a version of this was shown as "Restart automatically if the computer freezes."" 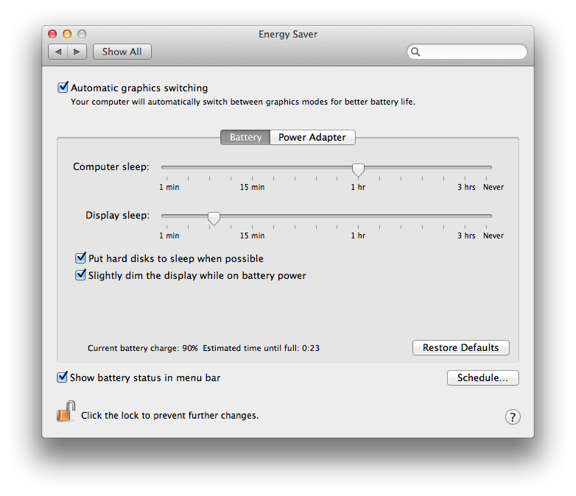 Both the Battery and Power Adapter panels have a checkbox at the bottom left: Show battery status in menu bar. When this is used a small battery icon appears on the menu bar with a display in black that indicates the amount of charge remaining. When low, this changes to red, and when really low a panel appears with a warning (a system voice may also make an announcement if activated in the Text to Speech panel of Dictation and Speech). A menu appears when the cursor clicks on the icon. Items in the menu are: Time remaining with the current charge, Power source (battery or power adapter), Show percentage and Open Energy Saver Preferences. When a power adapter is connected to the computer, menu items change and Time until full replaces time remaining (initially "Calculating time. . ." is shown). If there is a problem with the power source, for example the Mag Safe connector is not fully inserted, the icon may show, Not Charging. At the bottom right of the panels are two buttons. The topmost is marked, Restore Defaults which resets the panels. The one underneath has the word Schedule on it. This reveals a panel in which it is possible to set times for start and shutdown or sleep. Acheckbox turns on the action. These settings need Admin permission to change or activate. The buttons allow for the computer to start or wake up: Every Day, Weekdays, or Weekends. Specific days of the week are also available. The specific time may also be set. A button below is for selection of the action: sleep, restart or shutdown. As for Wake or Start up, days and times can also be specified.